I worked serving ice cream for 4 years and I met so many great people and made lifelong friends doing so. I was raised up on ice cream so to speak. I was eating “icecream” when my water broke with my first born! Now she is 16…. I love sharing ice cream with my one year old. He makes the funniest face beacuse it is cold!! 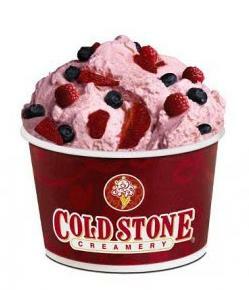 I follow cold stone on facebook! My favorite ice cream memory is going to get ice cream at out mini golf course like 3x a week every summer when i was a kid! I remember hearing the icecream man come around and begging my grandparents for some change so I could get a sweet treat. I used to love ordering from the icecream man, but I don’t think I’d go near one now. haha. My fave ice cream memory is when I gave my duaghter her first ice cream cone. There was such a look of pleasure on her face! Love the Mint Ice Cream with Chocolate Brownie and Chocolate Fudge. Major YUM!! Like Cold Stone on FB!! I love eating Cold Stone with my One year old daughter, she loves her sweets and her face is just hilarious when she tastes something cold! Enjoying a nice bowl of the cold stuff of a hot summer day is always a good memory, so refreshing! Liked cold stone on facebook!!! I’m from the Jersey Shore and every summer the italian ice stand opens up for business right down the street from a major public beach. To me it signifies summer. An average night you wait in a 30 plus person long line, but it’s expected and never bawked at! It’s just Jersey Dhore style!